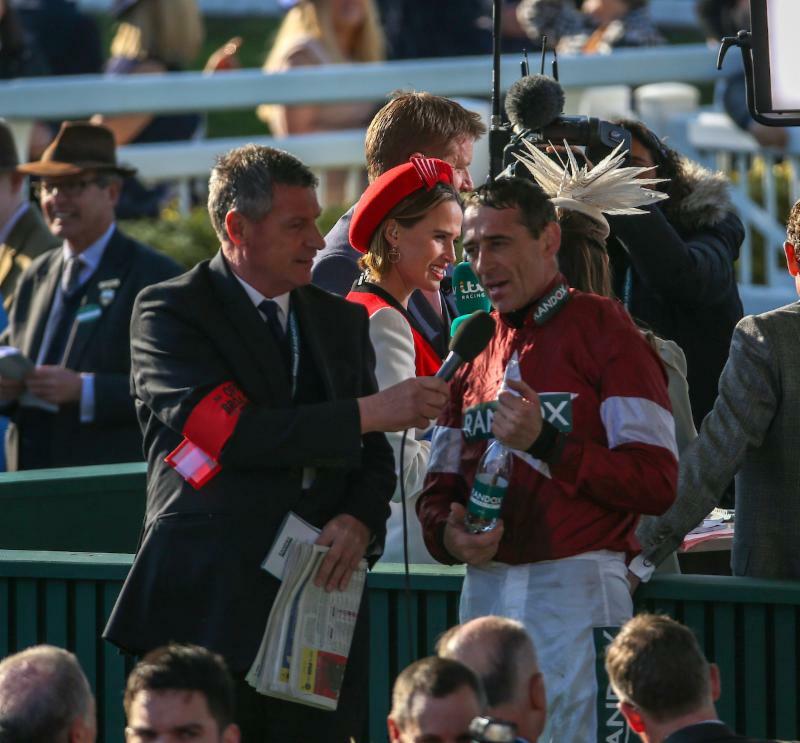 Davy Russell praised the "amazing" Tiger Roll after the diminutive nine-year-old became the first horse to win back-to-back Grand Nationals since the great Red Rum in 1974. "He's one hell of a horse. The O'Learys have been so good to me throughout my career, and Gordon too. What can I say. "Tiger Roll is just an amazing hose. He travelled really well throughout the race. I was a little bit afraid the blinkers had lit him up a bit too much but Gordon knew what he was doing. I don't think there's been a horse winning blinkers in a long time, but he was so good. "He gave a couple of stumbles at the back of a few fences but every time he gave a stumble he went and jumped the next one really well. He'd keep you on your toes the whole time. "For some reason he met a lot of fences closer than normal, but he had an awful lot of respect for them. I feel the cross-country races really crowned him, as they've taught him how to use his feet a little bit better. He used to be a bit of a bulldozer in his early days but knows now that it's a lot easier not to bulldoze them. "I was a little bit worried when we were walking around at the start as he got a little bit anti, but Denis O'Regan on another horse of Gigginstown guided him back to the bunch and I knew once he was in the bunch he was happy. "When he went to the front he was still quite strong on the bridle but he's a bit of a show off. I'd been a bit worried going round that he was doing a little bit too much, so I was trying to cool myself down and to cool him down too, which helped him a little bit. I was just afraid he wouldn't get a puncture if you know what I mean." Russell, whose father had travelled over for the race, added: "I just can't wait to talk to Finn and Lily. They are just obsessed with it. And Adelle obviously." Paddy Kennedy aboard second-placed Magic Of Light: "I'm delighted with her, she jumped and travelled everywhere. She came out of my hands at the Chair and I was lucky to survive that, but it was a great spin." Mark Walsh on Anibale Fly (fifth): "He jumped very well and got a bit tired, but it was great to be riding, he ran really well." Derek Fox, rider of One For Arthur (sixth): "I got into a bit of trouble on the way round. He jumped very well and I was going very well approaching three out, but I just got a bit tired after the second last. I had a great spin and it was great to be riding in it." Luke Dempsey, jockey of Folsom Blue (17th): "It was grand. I had a great ride round for most of the way before he got tired. The ground was a bit too quick for him." Jamie Codd, partnering Mala Beach (PU 29th): "He jumped brilliant, but he just never really got into the race." Patrick Mullins, aboard Don Poli (19th): "I had a good spin and he jumped well. He just got tired from three out." Sam Coltherd, on Captain Redbeard (16th): "I had a lovely spin, but he just didn't stay." Aidan Coleman, on Just A Par (PU 28th): "I had a great spin, but the ground was just a bit quick for him." Denis O'Regan, riding A Toi Phil (12th): "I had a great ride, he jumped fantastic. I couldn't have got a better ride and he will be even better." Tom Scudamore on Vieux Lion Rouge (15th): "I had my usual great ride off him, he just didn't get home from the back of the last. He has run a great race." James Bowen, jockey of Outlander (9th): "It was a real buzz, I didn't get very far in it last year. That's the second time I completed the course in the Grand National and it was just a buzz to get round." Daryl Jacob, partnering Valtor (18th): "He jumped super and gave me a great ride. He probably just got a little bit tired and the weight also told. " Sam Twiston-Davies, aboard Go Conquer (PU 29th): "I pulled up, had a great spin, but he just didn't stay." Paddy Brennan on Singlefarmpayment (8th): "I'm really proud of the horse, I had a good spin and he jumped super." Jack Kennedy, rider of Dounikos (PU 29th) "I got a great spin, he just got tired, but ran well up to a point." Richie McLernon on Minella Rocco (PU 21st): "He jumped superbly, but just got tired and we pulled up." David Noonan, partnering Ramses De Teillee (PU 28th): "It was grand. I made a mistake at the Canal Turn and he is only a seven-year-old, but it was probably just a bit of an ask for him." Robbie Power, jockey of Jury Duty (Fell 19th): "I was getting into the race and still travelling very well when he made a mistake and we unseated rider." Lizzie Kelly, aboard Tea For Two (PU 29th): "It was a nice spin round, but I just couldn't keep up with them, we ran out of puff." Tom Bellamy, riding Ballyoptic (Fell 26th): "I was going very well at the time when we fell. I wasn't saying I would have won, but I might have finished in the first six."